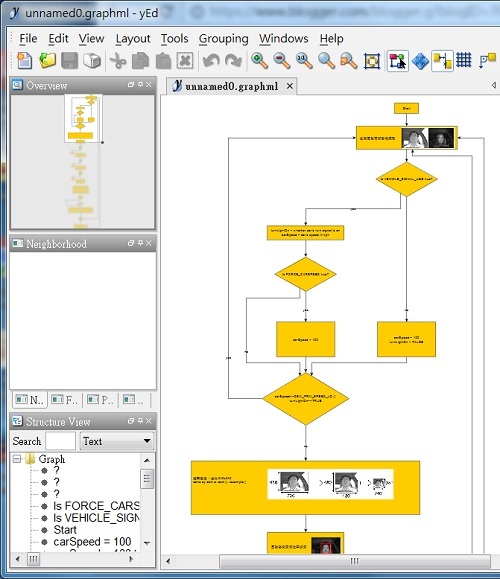 The Best Free Flowchart Software & Diagram Maker with Great Automatic Layout! The key feature I am looking for is perform automatic layout of the flowchart when I make changes. For example, when I add a new node in the middle of the flowchart, I don't want to manually move down the elements below it because it is a big hassle. Same thing applies when I remove a node somewhere. I'd like the layout of the nodes and links between the nodes to automatically reposition themselves so that the resulting flowchart diagram looks beautiful. Read on to see my recommendation for the best flowchart diagram tool. 1. yEd automatically repositions your nodes and lines beautifully. Simply go to Layout -> Hierarchical and press Ok button. This layout is good enough for me. If it's not good for you, try other layouts or adjust the layout settings. The One-Click Layout is good too. 2. yEd supports UTF-8 characters. 3. In yEd, you can attach one or more photos to a node; In fact, you can make it so that the photo is part of the node, i.e. when you move the node the photo moves with it. I know yEd has many more features but all I need is create a flowchart. If you need more than creating a flowchart look into yEd's feature list. You may be surprised yEd has got it all. There you have it. I believe yEd puts your flowchart diagram in a nice layout. If you don't believe me feel free to share your thoughts in the FB section at the bottom of this article. The following is other diagram maker software tools I've tried and my experience. 1. In code2flow, you cannot attach a photo to a node. 2. code2flow has trouble displaying UTF-8 characters. 3. Although code2flow automatically draws the flowchart for you, sometimes it looks bad and you want to correct it, but you have no control over it. 1. Although draw.io has automatic layout functions, it's pretty bad. Use it and you'll know what I mean.